5. M.F.K. 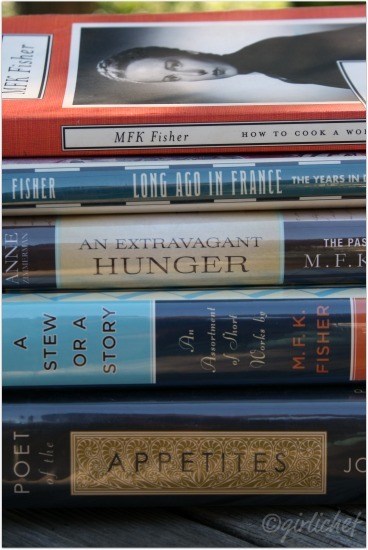 Fisher- Mary Frances Kennedy Fisher invented food writing. All food bloggers would like to be her. I don't know if I want to be her, but I surely would love to know her. When I read her name as number five on the list, it seemed to ring some bells. I just wasn't sure where those bells were coming from. Who is this woman that I should know and revere? So, of course I started searching her name of google, amazon, and my library website. I reserved a copy of every single book in our library system that was written (in full or in part) by Fisher. I realized where I'd seen her name recently. It was in a fantastic, instructional cookbook I'd checked out from the library about six months back- Japanese Cooking: A Simple Art by Shizuo Tsuji. Fisher wrote the eloquent introduction that sets the backdrop for non-Japanese people wanting to learn the art in their own kitchen. Well, I'm a bit embarrassed that I did not know more about her before. But I am whole-heartedly making up for that now. Since I knew that How to Cook a Wolf was written during war-times (dealing with food shortages and rationing) and my library didn't have it, I ordered a copy from Amazon right away so that I'd have time to read it. Born Mary Frances Kennedy in Albion, Michigan in the year 1908, her family moved to Quaker community in California, though she was raised Episcopalian. Her father was a journalist, so Mary Frances was exposed to writing and a love of literacy at an early age. She married her first husband Alfred Young Fisher, whom she met while studying at the University of California and later wrote Long Ago in France: The Years in Dijon in remembrance of their years living in the "gastronomical capital of the world." She gained an appreciation on how to live well- economically and consciously. In the midst of various jobs, she loved to read and was inspired by an Elizabethian cookbook she found at the library. In turn, she began writing essays on food, eating, and cooking. Many critics thought that her first book, Serve it Forth was written by a man since her writing style differed so much from other women writers of her time. Fisher actually wrote around thirty books and there are more written about her, in tribute to her...not to mention compilations of her work. One of her best know books, How to Cook a Wolf , published in 1942, is a series of chapters or "essays" on "how to live and dine sanely and pleasureably during wartime and within tight budgets." Although this was written during WWII, her words still ring true in the world of today. 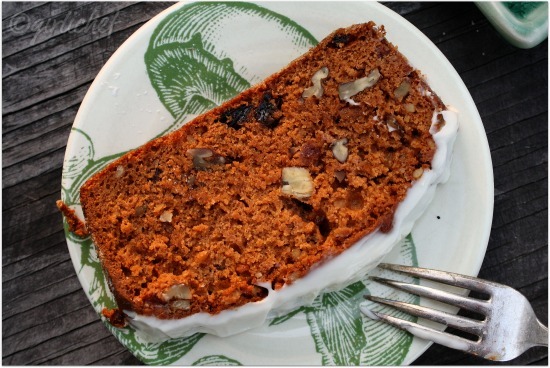 Reminiscent of pumpkin or carrot...people can't quite figure out what's in this cake. Perhaps it's the shape of it, like a loaf of quick bread, that perplexes people. It is moist and dense without being heavy. 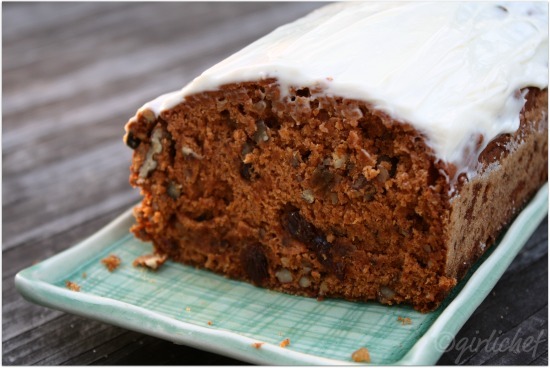 Sweet, yet laced with warming spices and studded with fruit and nuts, this loaf cake pairs as perfectly with afternoon coffee or tea as it does served as a dessert to a light meal. Tomato Soup Cake is one of those cakes I'd always heard talk of, but never tried. While initially I was going to go with something light, simple, and seasonal as is the style of Fisher, once I saw this cake in How to Cook a Wolf , I couldn't get it out of my head. I knew I needed to try it. While no cooking time was given and frosting was not included in the original recipe, neither was hard to figure out. She did say it was great "plain with coffee, or frosted with a covering of cream cheese and powdered sugar and a little rum if possible..." Sadly (for me), I was out of rum, but that didn't matter. I also love that she says: "This is a pleasant cake, which keeps well and puzzles people who ask what kind it is. It can be made in a moderate oven while you are cooking other things, which is always sensible and makes you feel rather noble, in itself a small but valuable pleasure." This cake contains no eggs and very minimal butter in the conscience of war-time shortages and rationing. 3 Tbs. butter, room temp. Preheat oven to 325° F. Cream butter and sugar. Grease and sugar a loaf pan; set aside. Combine baking soda with tomato soup...it'll be all bubbly and hard to turn away from (chemistry!). Sift spices and flour together in a separate bowl. Alternately add liquid and dry mixture in a couple of additions until just combined. Fold dried fruit and nuts in to batter. Scoop the thick batter into prepared pan, smoothing the top. Slide into oven and bake for ~60 minutes, until a toothpick inserted in the center comes out clean. Cool on a wire rack until cool enough to turn out of pan. Replace loaf on rack until almost cool. Beat cream cheese and powdered sugar together and smooth across the top. Serve slices of slightly warm loaf cake alongside a cup of coffee or tea...a cold glass of milk. Also good at room temperature or even cold. Love these posts about the game changing women. We owe them so much! exquisito este cake de tomate, los libros parecen muy interesantes. Well, I would never have believed a cake would be made from tomato soup. I cannot even imagine the flavour, but it sure does look good. The things you learn in blogland! I love M.F.K. Fisher. I keep one of her books in my car at all times, so if I am ever stuck anywhere without anything to read, she is always ready! This is certainly a game changer Heather. I have read many of Ms. Fishers books but have to admit it has been years since she was first introduced to me, long before blogging, even long before I knew I had such a passion for food. What a delicious looking bite of cake you have at the bottom! I was hoping someone would make this cake! Your's looks delicious! Wow....I haven't had Tomato Soup Cake in years. My Mom use to make it...thanks for the "Blast from the Past." 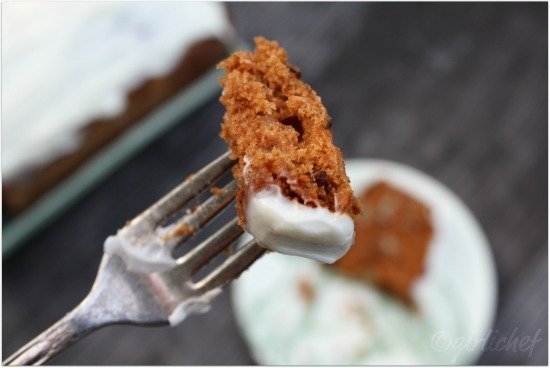 who would have thought that tomato soup cake could be tasty? i am intrigued to try this out though! Great post, Heather. I've heard of M.F.K. Fisher but never knew much about her. No wonder she is on the list of 50 important women in the food world. She was a pioneer in writing about food. I can imagine that the tomato soup and spices produce a delicious cake. What a cool idea--to work your way through the list! I'm afraid to click on the list, however. Please tell me that Rachael Ray isn't on it? Thank you so much for sharing about Mary Frances Kennedy Fisher. This tomato soup cake looks fantastic! Que delicia de receta, se ve realmente maravillosa. I raise my glass to women who love to cook! Who inspire us to share the grace of food with others. I would not have thought that soup and cake can be combined into one!! Hi girlichef! What an interesting post! But again ingredients beat me: what on earth is neufchatel? Thanks for introducing me to a wonderful cook. Tomato soup cake looks delicious. I definitely considered making this and then I got a little freaked out! But I'm so glad it turned out because now I'm going to HAVE to try it! You did cover it with cream cheese frosting, after all. first time i've heard of this wonderful cake...and i would so love to try it! Fascinating post - and I need to catch up with Mary also. I couldn't get this out of my head either - it is on my agenda. And with your wonderful tidbits, I know I need to learn more about her. The quote at the end resonated. Oh my this sound so good and very interesting. Happy weekend! I've always wanted to try a Tomato Soup cake, but wouldn't you know it...can't find a can of Campbell's Tomato Soup anywhere in my small town. :P I'm tempted to try using tomato sauce. The color of this cake is absolutely stunning! I've not heard of her! ok, somewhat off the subject. Do you have any cookbooks from Diane Kennedy? I may not have the first name right. She lived in Mexico and was cooking the regional fare long before Rick Bayless. I want to get her cookbooks. @Lea Ann... Yes, I know of Diana Kennedy (she's actually on that list of 50 women a while on down the road). I don't own any of her books, but I've checked them all the ones out that my library has on numerous occasions. I don't think you can go wrong with any. The Art of Mexican Cooking and My Mexico are probably the ones I check out most often. The Essential Cuisines of Mexico and From My Mexican Kitchen are also amazing. I haven't found Oaxaca al Gusto yet...but it LOOKS gorgeous and I'm sure is equally amazing. There's more that I haven't seen (older), but you've reminded me and now I want to order some! It is so interesting learning more about these 50 women, of course some that are "in your face" do we need to know more? Ha! maybe a little more behind the women! Anyway I didn't know much about M.F.K. Fisher before thanks! The cake looks really beautiful, I would love to try it! It is interesting to find recipes back then during wartime and the depression and how well the "housewives" still took care of their families! Thanks for highlighting these standout chefs & for sharing on Momtrends. wow, this cake sounds great! i'll have to see if i can make it gluten-free! My mom use to make a tomato soup cake for my lunch when I was in grade school. She always called it a spice cake. Yours looks lovely! Enjoyed your post! I didn't agree with the list from Gourmet…they left out some really significant culinary people! Marion Cunningham, Dorie Greenspan, Clementine Paddleford and Rose Levy Beranbaum just to name a few. These women should have made the list before many of the others! Spectacular cake.. Never heard of tomato soup..Love to give a try.. So perfect a reflection of her times 'during the war' when canned soups and 'makig do' called for ingenuity ... excellent post! I love learning more and more about these fabulous women! We all take such different 'tacks'!